Brad A. Johnson of Angeleno Magazine bestowed his awards on the best of Los Angeles, as he does every year, and it was time to celebrate. Thankfully, I had the opportunity to participate in this celebration, and boy did it impress. So I didn’t get to try everything before the tastes ran out – but I don’t really blame the event organizers. I blame my sloth pace at really savoring every bite there was in the Fairmont Miramar’s beautifully appointed parking circle, which surrounds probably the oldest tree I know in Los Angeles. I was happy to note that Oxley Gin was a liquor sponsor (along with Veev), and whom created the cocktails with which I washed down all the heavenly plates of food. It was an impressive showing, indeed. 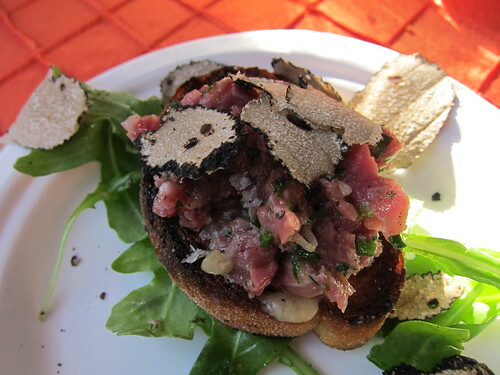 The beef tartar could have stood on its own – nevermind that the shavings of black truffles put it over the top in the best possible way. I had two. Another favorite was Chef Ben Bailly’s Cauliflower Panna Cotta topped by Petrossian Transmontanous caviar. 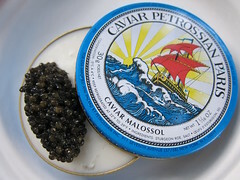 So indulgent and so delicious – it was like creamy heaven accented with that perfect, almost briny zest caviar gives. I, again, had two. 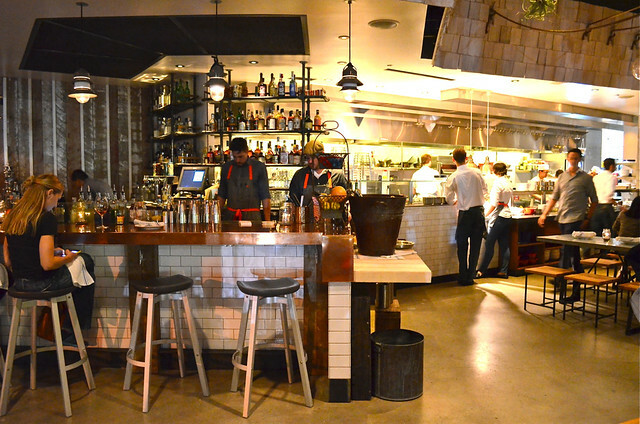 Chef Ludo Lefebvre was there to deliver punches to the mouth. Not literally, of course, but his Heirloom tomato smoothie came accented with its own extractions from the sea:Â Squid ink vodka jelly and seaweed tartar. As with LudoBites, the combination of everything together was done amazingly well – while in fact I love tomatoes, seaweed, squid ink and vodka individually. The shooter was surprisingly spicy, with the umami of the squid ink and seaweed probably augmented by the vodka. Delicious. 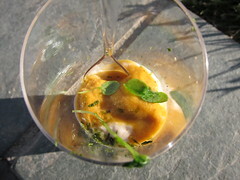 LaurentÂ Quenioux from Bistro LQ’s Lobster Tapioca topped with uni was amazing as always. Once upon a time I did the tasting menu at Bistro LQ and the lobster tapioca in particular, as one of theÂ starters,Â was my favorite dish. It was a decadent revisit and one I was glad to have. 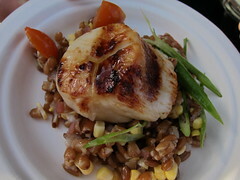 My favorite fish of the night, however, was prepared by Chef Josiah Citrin of MÃ©lisse. 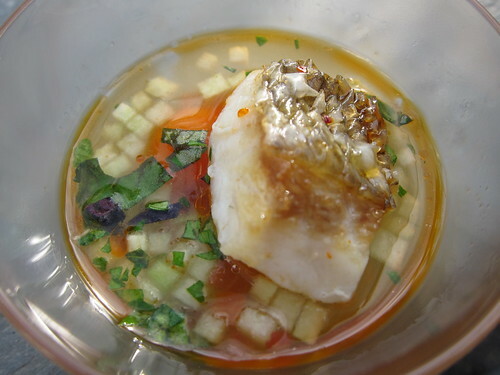 The loup de mer,Â or seabass,Â stillÂ had the skin onÂ which helped retain a lot of the flavor and came in a pool of appropriately oily broth, heirloom tomatoes, cucumbers and basil. It was refreshing yet surprisingly weighty. The tiny filets were cooked to a perfectly tender consistency, and I was amazed I could appreciate the flavor in such a small piece of fish.